My brother recently came up to the Upper Peninsula for our annual duck camp. The birds were a bit scarce this year, but we still managed to find a few duck dinners over the five days that we hunted. 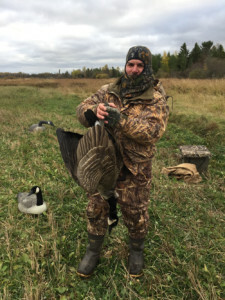 Gerry was lucky enough to shoot a goose – a rarity on our October hunts. When he comes up, I take time off work and we spend just about every day in the blind, from before daylight until after dark. We don’t have any trouble falling asleep when we get home after being hyper-observant and watching the horizon for birds all day. We always see more than just ducks and geese, and one of these days I should keep track of the number of bird species that we see pass by. Some of the regulars are sandhill cranes and tundra swans, a variety of shorebirds that we can’t identify, as well as bald eagles and migrating hawks, mostly northern harriers. It’s been interesting to watch the number of tundra swans rise and fall in our neighborhood through the years. Twenty years ago, when we started seeing swans, it meant winter was not far behind and the season was coming to a close. These days, it’s not unusual to see swans within the first week of October or earlier. Mallards and black ducks often like to hang out with tundra swans, so we usually have a swan decoy in our spread. It’s really a Canada goose decoy painted white, but it’s useful to help ducks feel more confident in landing, and it sometimes helps attract the few snow geese that migrate through the Eastern U.P. This year, like most years, we had fun calling tundra swans in by mouth. It’s fairly easy to mimic their calls, and they’re like 747 aircraft coming in to land, compared to smaller ducks, or even geese. Watching swans and other birds such as grebes and shorebirds helps pass the time between flights of ducks. The abundance of winged wildlife, coupled with sunrise, sunset, and lake-effect rain and snow squalls, reminds us why we like to sit out in the marsh in a tiny boat all day.